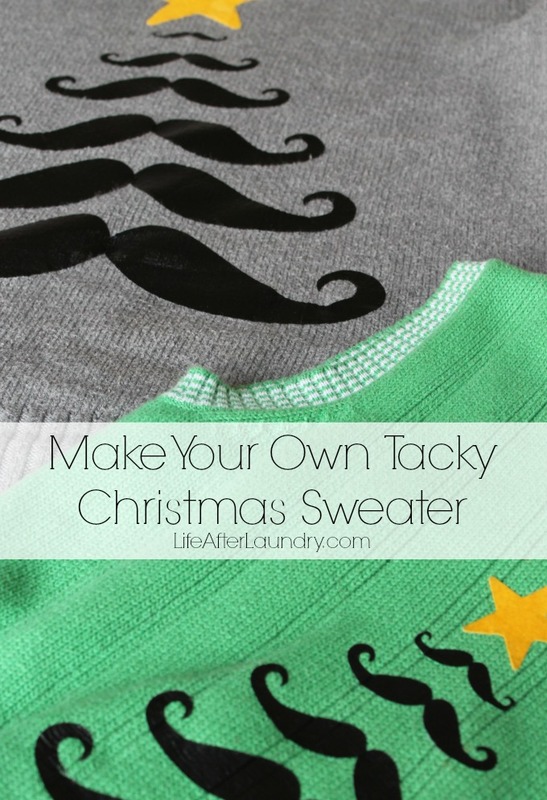 Make your own tacky Christmas sweater – you will be the hit of the party and have a sweater that is truly unique. Last year’s Tacky Christmas Sweater party was a huge hit, so we had another one this year. Derrick’s sweater was pretty good last year, so we were kind of wondering if it was possible to top this year. However, when in doubt, go with mustaches and you are sure to have a hit. 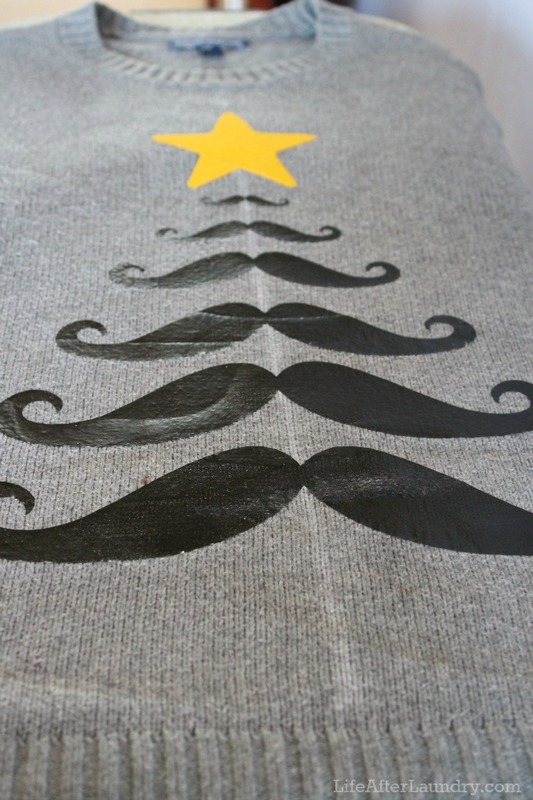 I really have no idea why mustaches are so popular right now, but we played it up with this mustache Christmas tree sweater. Just like last year’s sweater, I made my Silhouette do the work for me. Everything we added to the sweater was heat transfer vinyl, which made it super simple to create. In fact it was so easy, that I made these the day of the party. 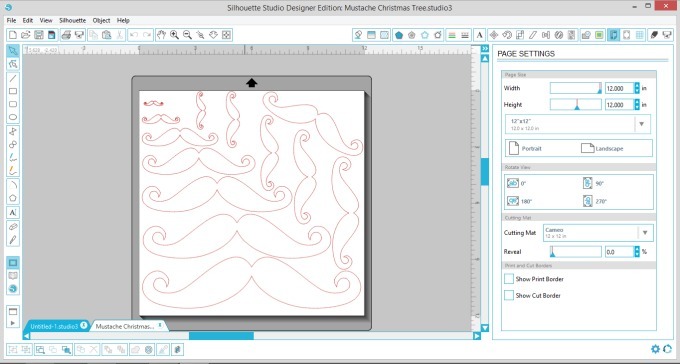 I bought this shape from the Silhouette store and filled my page with mustaches to cut. I started at 12 inches for my husbands sweater and decreased the size by 2 inches. For my sons sweater I started at 6 inches and decreased it by 1 inch every time. 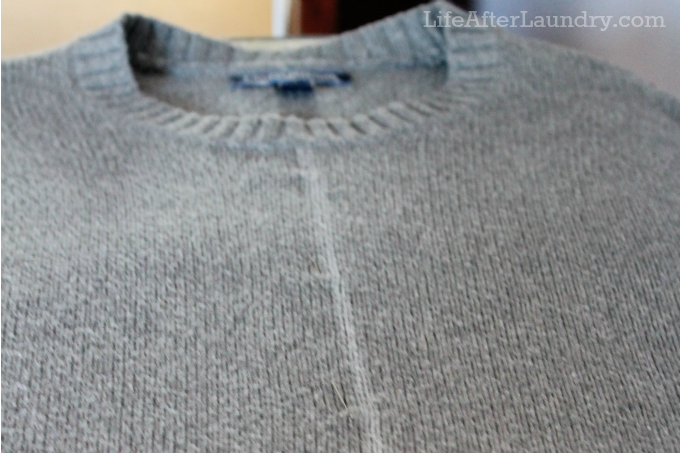 I folded the sweaters in half and marked a line down the middle with chalk to make it easier to line up my mustaches. I used my iron and small cloth to apply the pieces to the sweater according to the heat transfer vinyl instructions. I love using Silhouette’s Heat Transfer Vinyl. Any time I make something I want it to look as good as a store bought version. Using my machine and the vinyl, I feel like it turned out exactly how I wanted it. 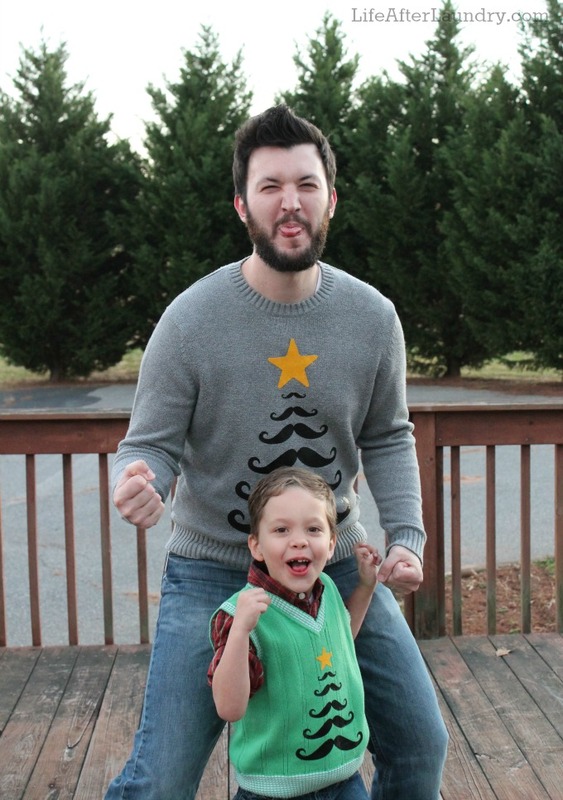 I asked my husband and son to pose for a picture of the sweater I lovingly made them. Well, my son didn’t want to cooperate, so here is a silly picture of my husband and son in their sweaters. (One that they probably didn’t think I would post) Maybe next time he will take me a little more serious and give momma a nice picture! 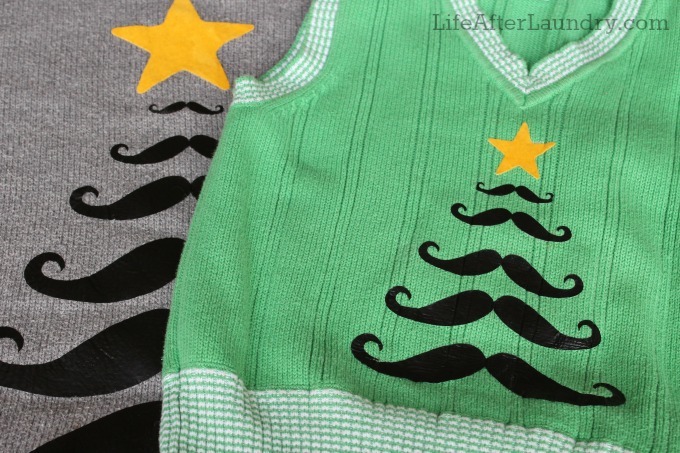 Need more tacky sweater inspiration? Be sure to check out the sweater I made last year! 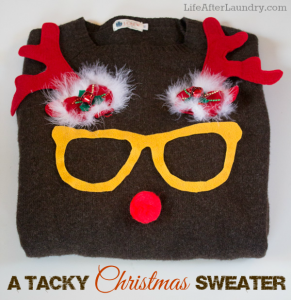 Do you have a tacky Christmas sweater party to go to this year? Affiliate links are included in this post. Check out my disclosure page to find out more. Such a cute idea, Brenna! 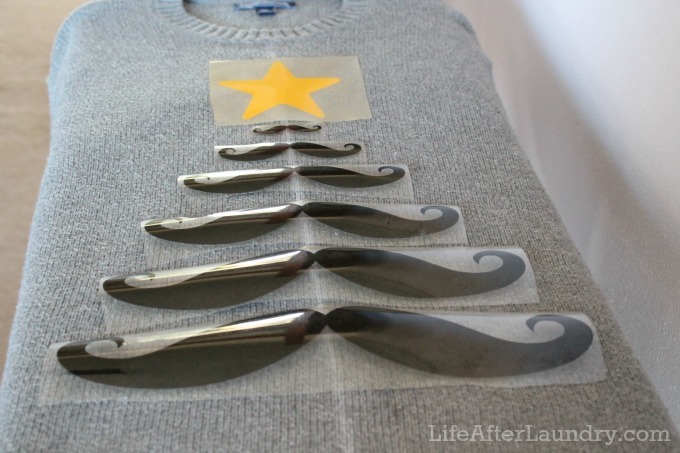 I love the mustache tree. Pinned. I’m so sorry to hear that. Are you viewing my site on a mobile device or a desktop?